We cannot display this galleryWhat you’re looking at here is ‘the most track-capable Camaro ever’, the 2018 Camaro ZL1 1LE. Like the V6 and V8 iterations before it, the 1LE extreme track package turns the dial of the already brutal ZL1 up to ‘11’, and rather fittingly for the most powerful Camaro yet, this also marks the biggest 1LE transformation too. Starting with Aerodynamics, the new – and pretty enormous – rear spoiler is made entirely from carbon fibre to match the exposed carbon fibre bonnet. Working in tandem with the new front splitter (part of a revised fascia alongside a wider front grille), the rear wing is designed to provide up to 300lb of downforce at top speed, not that Chevrolet has confirmed what that is yet. 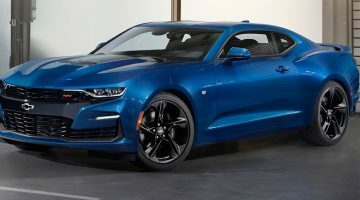 New 19in wheels are fitted with performance, Goodyear Eagle F1 Supercar rubber, the widest tyres yet seen on a production Camaro (305mm at the front, 325mm at the rear). Underneath lies a ‘LT4’ supercharged V8 that sends 650bhp (10bhp more than the ZL1) to the rear wheels via a six-speed manual gearbox. The suspension meanwhile has been given a major overhaul – including racing-derived, lightweight Multimatic DSSV dampers as found on the previous Z28 – for improved road holding, while a sort-of-strict diet means the 1LE has dropped 27kg over its ZL1 base. All this combined means the 1LE is three seconds faster around Chevy’s Milford Road Course test facility (don’t ask for context, we don’t have it). 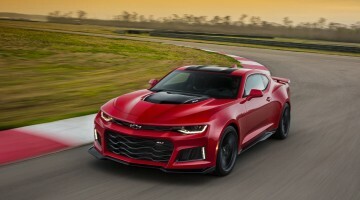 Enjoy this Chevrolet Camaro ZL1 1LE news story?